An electric recumbent tricycle can be the perfect solution for a recumbent rider that would like to have some help when the going gets a little tough. Or anyone that wants to add a little spice to his or her riding experience. Some times you just want to take a break from pedaling and just sit back and enjoy the ride. Or maybe you just want a little help on hills or riding into a headwind. 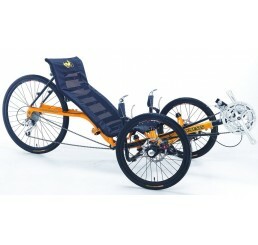 With an electric recumbent you can choose what kind of ride you want and do it in comfort. The older style two wheel recumbents have all but been replaced by the three wheel designs. The big advantage here is eliminating the balance issues making them much more rider friendly. This is especially true when starting from a dead stop which can be a bit of a challenge with a two wheeled recumbent. And the heavy duty brakes enhance to control as well. It can be pedaled at any time with or without pedal assist. The seats are adjustable for maximum comfort and pedaling efficiency. It has a weight capacity of 275 lbs so it will accommodate larger body types. Add it all up and you get a sweet ride that just about anyone can enjoy.